Newsworthy not just because it has finally happened after several abortive attempts, but also because it represents the next major stage of Swindon Panel’s transition into preservation. 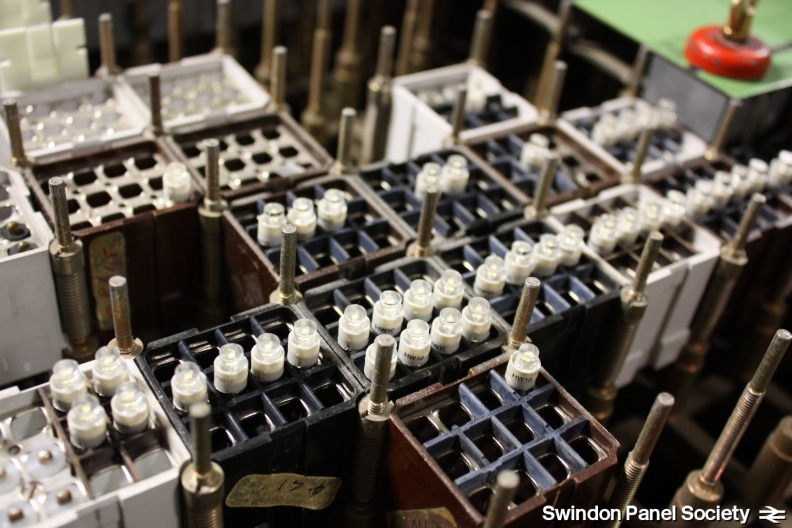 This is the second part of the panel to be closed (following the Kemble line a year ago) and means that the east position in Swindon Panel is now closed. 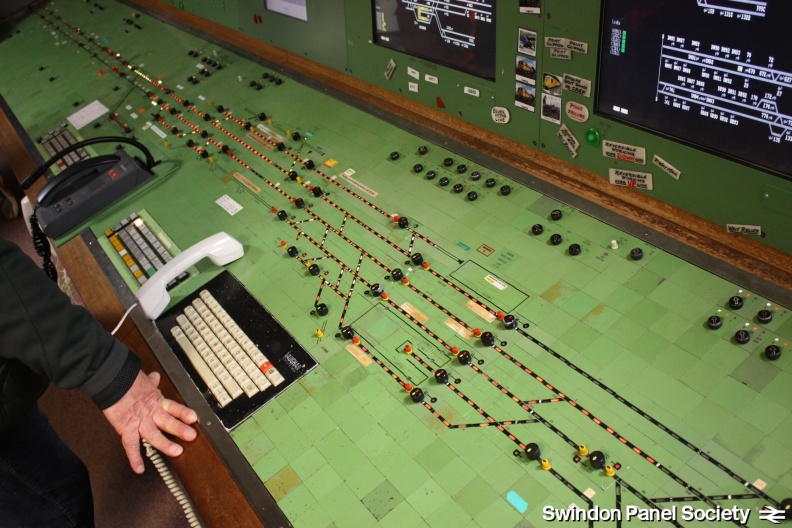 The last train to be signalled by the east end of the panel was 1C36, which ran reversible from Uffington to Swindon due to a track circuit failure at Knighton! The signalling was disconnected at 0135 on 21/11/15 in a possession that lasts the whole weekend. One-by-one the interlocking power was disconnected at Uffington, Bourton, South Marston, Highworth Jn and Swindon interlockings, and the panel indications failed in sympathy. Areas of the panel that are indicated by remote control go blank when the fail, with the extremities of the failure being indicated by a pair of white flashing lights. The areas of the panel that are indicated direcctly flood red when they fail. 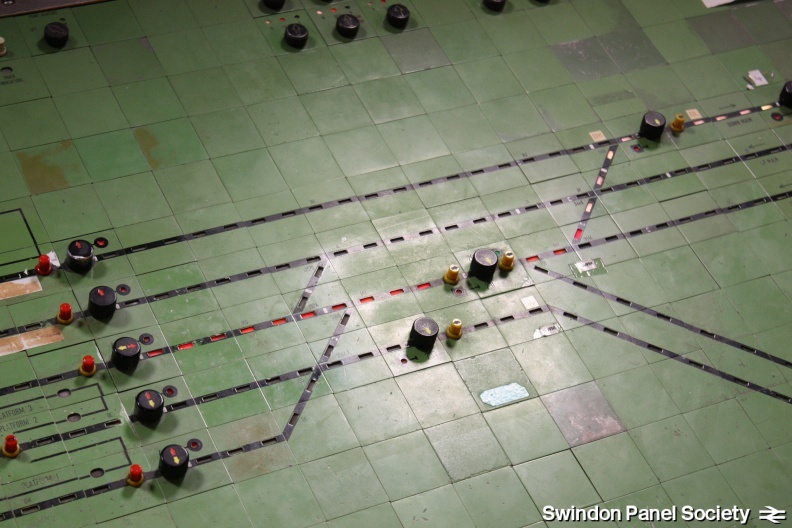 The remote controlled interlocking areas show their flashing failure lamps. We were very pleased that the removal of the panel tiles was authorised immediately. This was unexpectedly soon! Some detail of the bases under the tiles. Unfortunately, after about 20 columns of tiles were removed, a minor wiring issue meant we have been asked to temporarily stop removing them for the moment. 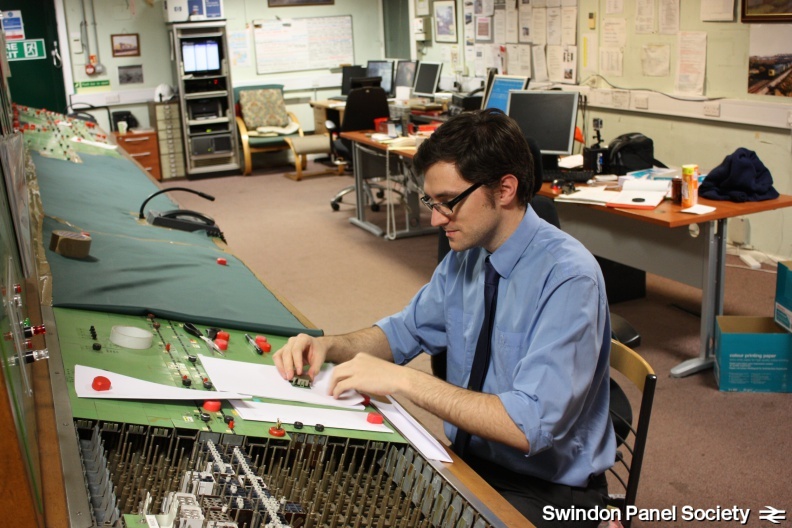 The issue is that some fault circuits are still connected, and if we remove the switches that allow the signalman to cancel the fault alarm bell then he won’t be able to cancel it! Hopefully we will be on the road again shortly. The railway re-opens on Monday 23 November, controlled from the Thames Valley Signalling Centre.